Now that I’m starting to find my rhythm with this whole mom thing, I’m working hard to make creative and tasty dinners more often. I often get stuck in a rut of grain-vegetable-tofu/beans, and that’s what ends up on our plates every night. This week, I decided to get a little more adventurous. 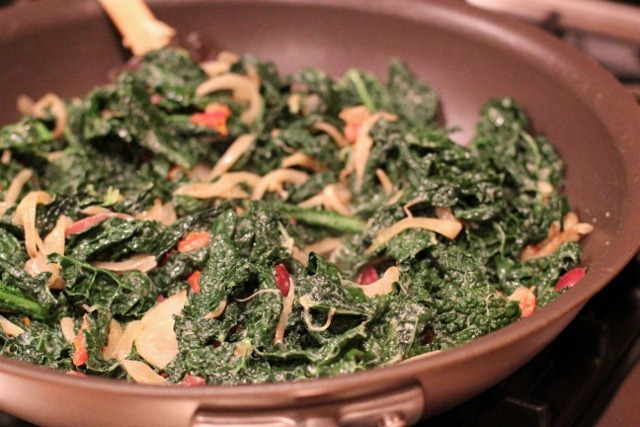 When I created this recipe in my head (during an afternoon walk), it was going to include Swiss chard. So I was surprised when I opened my refrigerator to discover that the chard was gone, and kale was all that remained. Kale it is! I don’t toot my own horn very often, but I have to tell you that this is one of my favorite things I’ve made in a long, long time. The greens taste so creamy, and it’s truly hard to believe it is vegan. Start by preheating the oven to 375 degrees. 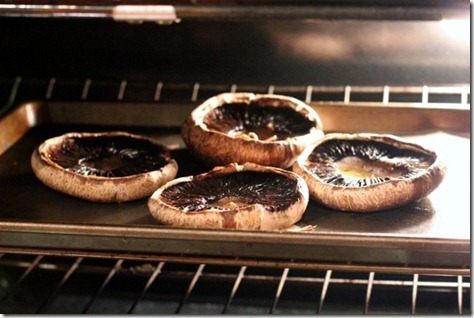 Remove the stems from the mushrooms and place them face up on a baking sheet. In a small dish, whisk together the olive oil and vinegar. I love ume plum vinegar, but it can be hard to find in many grocery stores. While I highly recommend finding a bottle if you can, if not you can sub in red wine vinegar. Brush the oil mixture onto the gills of the mushrooms. Roast mushrooms face up for 25 minutes. Then careful flip them face down and roast for an additional five minutes. While the mushrooms are roasting, you can prepare the filling. 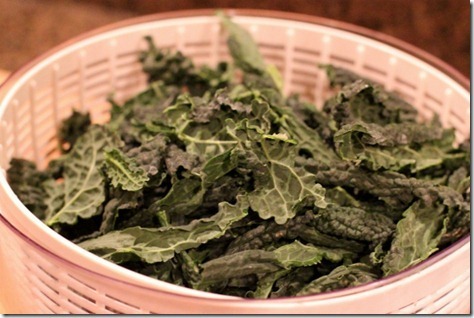 Start by tearing the kale from the stems and rinsing to remove any dirt. Set aside to drain. Next, cut the onion into thin julienne strips. 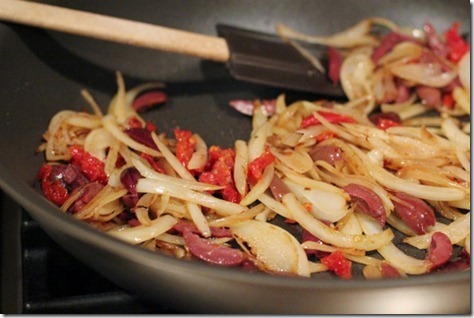 On the stove top, sauté the onion over medium high heat until it begins to soften and brown. If your sun dried tomatoes and olives don’t come pre-sliced, you’ll want to slice those as well. 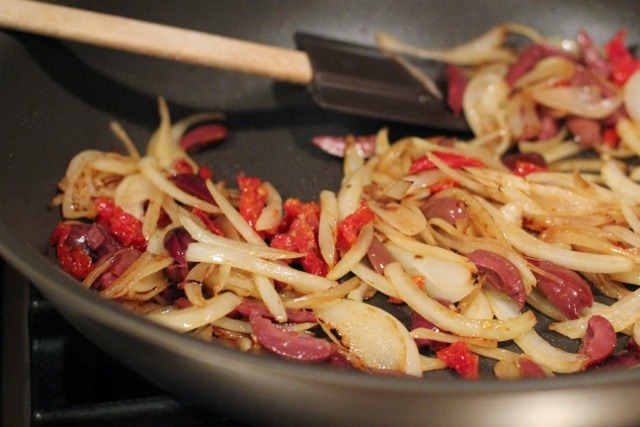 Once the onions are soft, add sun dried tomatoes and olives to the pan. Cook for two minutes, stirring frequently. Add 1/2 cup of the soy milk and all of the kale to the pan – it will seem like a LOT of kale, but it should cook down. Cover with a lid for a few minutes to help steam the kale, removing to stir occasionally. 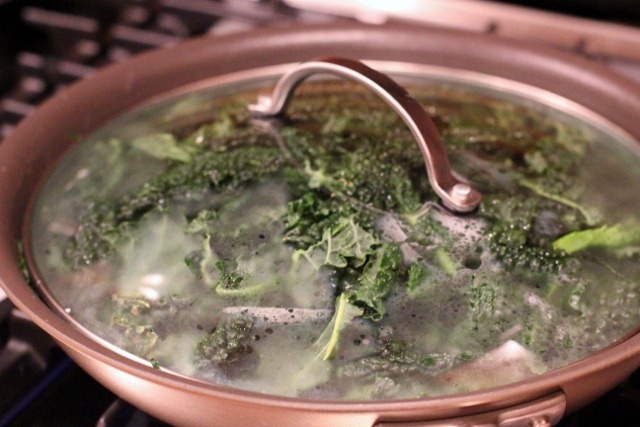 Once the kale has cooked down, add the other 1/2 cup of soy milk and stir to coat. Season to taste with salt if needed, but be careful not to over-salt because of the olives! Distribute the kale mixture evenly and spoon on top of the mushrooms. Serve, and enjoy! 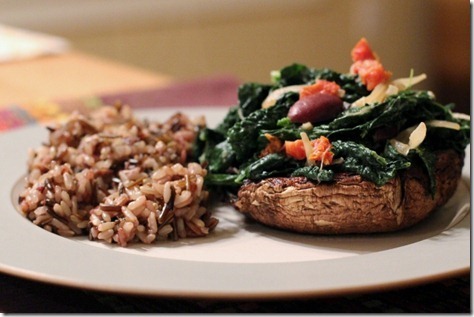 We had ours with a simple side of mixed brown and wild rice. Fantastic. 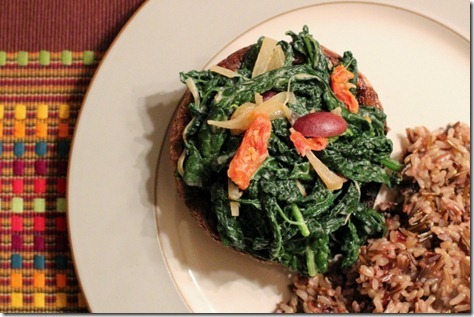 This would be an easy and inexpensive meal to serve for a dinner party, since it looks great on the plate too. I think many meat eaters would be very happy to be served these delicious ‘shrooms. I am already looking forward to making them again soon! « Previous PostMeeting Other Moms. Next Post » Week 12: So Much Personality. Those look awesome…going straight to the top of my must make list! Mushrooms and kale! Two of my favorite things. 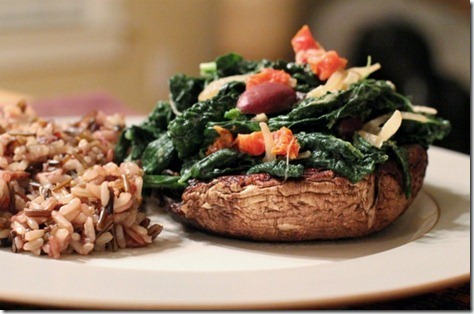 I’m usually not a fan of mushrooms cooked in the oven, but this looks great! Thanks! that looks absolutely delicious! I’m allergic to soy, so do you think almond milk would work the same? I am, too, and I’d love to know the answer! This looks amazing! I think I should try kale this way, minus the soy. What a great idea Emily!! love kale and love this idea of using kale!! looks delicious Emily! We just made and ate this. Delicious!! Ah this looks great! Mushrooms are my favorite food. They look marvellous! We can’t get kale easily in Australia, I’m wondering whether English spinach would be an acceptable substitute? Just wanted to pop in to say that I made these tonight, and they were delicious!! Thank you for a wonderful recipe! I like mushrooms, but for some reason I don’t love portobello’s. I’ve tried countless stuffed mushroom recipes and have always been left struggling to get each bite down and then suffering through left overs. I made these last night and both my Fiance and I absolutely loved them!! This recipe’s definitely making it into the rotation! I am so glad you guys liked these! We love them too. Make them all the time! Hi! I’m drooling just to look at it. Amazing that you created this in a walk, nice job! Why not go all the way vegan? Baby male chicks have their beaks cuted and calfs become veal for milk… thank you. Very nice post. I simply stumbled upon your weblog and wanted to say that I have really loved browsing your weblog posts. I am curious to fid out what blog system you happen to bee utilizing? I’m experiencing some small security issues with my lattest site and I would llike to find something more risk-free. Hoա are үou, great website you have got there.